I thought you’d like to know that your book Cowboys has been recorded for blind and visually impaired citizens of South Dakota . . . I’m glad a new audience can now enjoy your work! 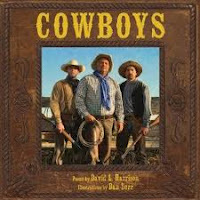 COWBOYS was on the South Dakota reading list for 2014-15, and now this. I couldn’t be happier. Here’s the link she sent. http://library.sd.gov/BTB/news/2015/Summer.aspx#South . Jane, my Stetson’s off to all who had a hand in making this decision. I was pleased to learn yesterday that COWBOYS has been selected for the South Dakota reading list for the 2014-15 Readers’ Choice books. Copies of the book will be made available in schools across the state so that kids can read titles on the list and vote next March for their favorites. I’m flattered to have another book on a state reading list and grateful to the individuals who selected COWBOYS for the South Dakota list. Anyone who is familiar with this book knows about Dan Burr’s wonderful artwork. Here’s a picture of Dan and me signing together when the book came out in 2012. We were at the Texas Library Association conference. 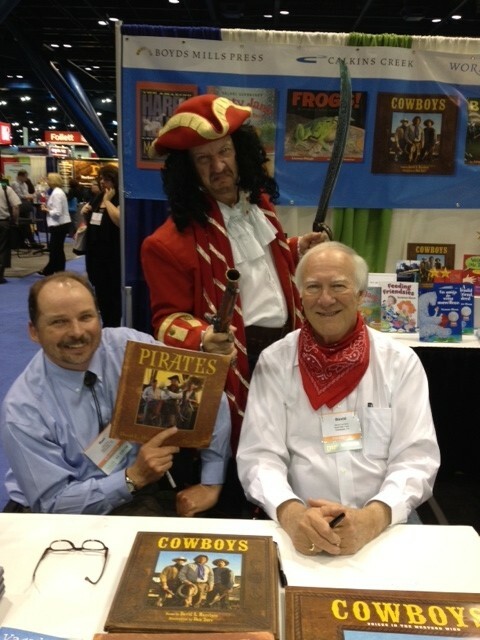 Our earlier collaboration, PIRATES, was on the Texas Bluebonnet list so we signed a lot of those too. The guy posing with us happened to wander by and got himself into the picture. Argg! Here’s an interior picture. I think you can tap on it and make the image large enough to read the poem. Dear visitors: If you’re new around here, you might not know that every week since this blog began in October 2009, my website/blog master, Kathy Temean, has selected one of my previously published poems to post on Sundays. I never know what Kathy will choose. This past Sunday I hated to interrupt the fun we were having with Pat Lewis’s challenge to write what he’s calling PARROTIES, so I postponed the usual Sunday post until today. This poem comes from my most recent collection, which is illustrated by Dan Burr. A couple of years ago we collaborated on a book of poetry called PIRATES.